All Stone Temple Pilots items listed below are authentic and very limited. We do not carry multiple items. All prices and availability are subject to change. All prices include shipping and handling for all USA customers. All other destinations will require actual shipping cost to complete transaction. Have a question? Ask us before purchasing the item. Thank You. 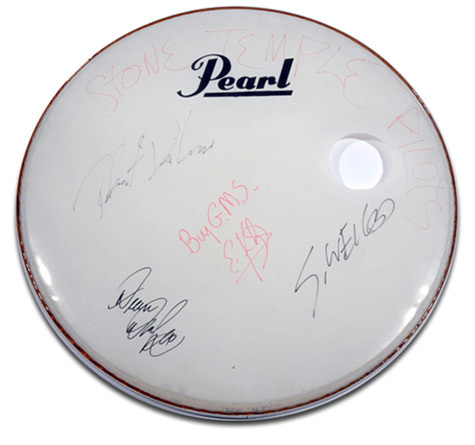 Description: 30" Pearl Bass Drum Head Signed by Stone Temple Pilots. Signed in black and red sharpie pens. Note: Item signed while on STP's July 8th, 1994 US tour backstage at the Starplex Amphitheater in Dallas, TX. Description: STP Dean DeLeo Concert Tour Guitar Pick.